Couples in developed countries are having fewer and fewer children. It has been widely observed, for example, that the average fertility rate of most developed nations is well below the replacement rate of 2.1 children. This generally means that, immigration apart, populations are on the decline. The trend has been particularly pronounced in Europe with Germany, Austria, Spain, Portugal, and Italy among others very near the bottom of the list. Asia, however, has not been immune to the trend. Japan, South Korea, Singapore, and Hong Kong also inhabit the bottom of the list. African nations are near the top and the US, something of an exception among developed nations, maintain a fertility rate right at 2.1. A number of factors have contributed to this state of affairs, a good number of them economic. A quick search on the internet for the “cost of having children” will yield over 8 million hits, and a quick “unscientific” glance at the leading results seems to suggest that the cost is quite high and that this is on the mind of a lot of people. Young couples also seem to struggle with the loss of independence, career costs, and the responsibility that children entail. Generally speaking, social scientific data and quantifiable cost/benefit analysis seem to suggest that children are not conducive to overall happiness. If … you’re interested in kids, but scared of the sacrifices, research has two big lessons. First, parents’ sacrifice is much smaller than it looks, and childless and single is far inferior to married with children. Second, parents’ sacrifice is much larger than it has to be. Twin and adoption research shows that you don’t have to go the extra mile to prepare your kids for the future. Instead of trying to mold your children into perfect adults, you can safely kick back, relax and enjoy your journey together—and seriously consider adding another passenger. Admittedly, this is comes off as a less than ringing endorsement of childbearing. “Have children, it’s not as bad as you’ve been led to believe” is not quite a rallying cry. But then again, social scientific data and quantifiable cost/benefit analysis also frame Caplan’s argument, and it seems misguided to capture the meaning of a child’s life and the experience of parenting with its tears and joys in a simple statistical survey or a budget line item. Perhaps it is the reduction of social life to economic life, that accounts for the changing patterns of childbearing; perhaps it is an almost narcissistic view of personal fulfillment. None of this is intended as a brief for perpetual pregnancy. However, it is a lament of sorts for the state of affairs which renders a child something of a burden and measures the meaning of life statistically. 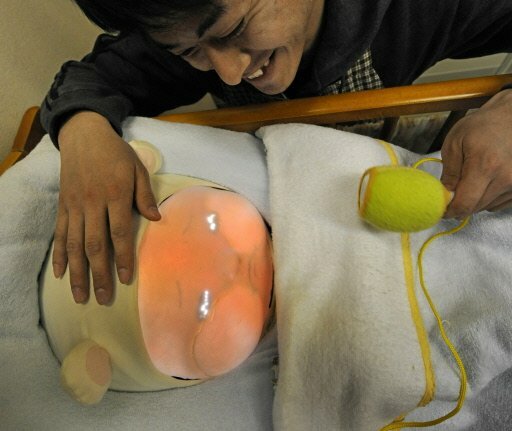 Something has gone wrong when in Japan hopes are pinned on a robotic baby, and a rather eerie one at that, to encourage couples to have a child. And this after a cash bonus from the government seems not to have done the trick. The only high-quality study of parents’ satisfaction dates back to a nation-wide survey of about 1,400 parents by the Research Analysis Corp. in 1976, but its results were stark: When asked, “If you had it to do over again, would you or would you not have children?” 91% of parents said yes, and only 7% expressed buyer’s remorse.